SYDNEY, Australia -- The president of Ukraine, Petro Poroshenko, said in Sydney on Friday that the war-torn east of his country had just had its first day without military or civilian casualties in seven months. Ukraine president Petro Poroshenko greets supporters after delivering an address at the Lowy Institute in Sydney on Friday. He told the Lowy Institute the milestone was proof the west’s diplomatic pressure and sanctions against Russia – which is backing separatist rebels in the east – were bearing fruit. Ukraine and Russia agreed this past Tuesday would be a “day of silence” in the conflict, but both sides have since accused each other of violating the agreement. A truce agreed in September has also been regularly breached. 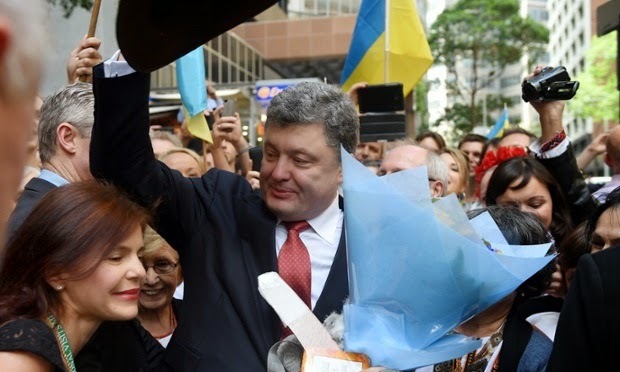 Poroshenko is visiting Australia for the first time since he was elected president in May, two months after Russian-backed forces annexed Crimea, and two months before a passenger jet carrying 298 people was shot down over Donetsk. Thirty-eight Australian citizens and residents were killed in the catastrophe, which Poroshenko said had united the two countries in “common pain”. “From the very first second of this terrorist attack, we, the Ukrainian people, and me, the Ukrainian president, were together with Australians,” he said. The Australian prime minister, Tony Abbott, was among the first world leaders he called to promise an “open, independent investigation” of the tragedy, Poroshenko said. “It was absolutely unacceptable how the victims’ bodies were treated in the aftermath of the tragedy,” he added, in reference to alleged tampering by rebels at the crash site. Poroshenko repeatedly thanked the Abbott government for the “solidarity” it had shown Ukraine since the incident, including suggestions on Friday morning that Australian coal and uranium might be exported to the country to help avert an energy crisis. Abbott has also promised to visit Ukraine and send Australia’s first ambassador to Kiev next year. Poroshenko repeated his call for the Russian president, Vladimir Putin, to end the 10-month conflict. “Let’s stop it, let’s get Russian troops out of Ukraine, let’s close the Russian-Ukrainian border,” he said. More than 4,300 people have been killed since street protests forced the Russian-backed former president, Viktor Yanukovych, from office in February. The president said the war in the country’s east was not just about territorial integrity, but “global freedom, global democracy and global security”. Russian aggression showed the post-cold war security system was “ineffective” and needed to be rebuilt, he added. Asked his opinion of Putin, Poroshenko was cautious, saying the Russian president had “changed” in the past decade. Ukraine had become “an emotional matter” for Putin, he said. Supporters in traditional costumes and the country’s blue and yellow colours formed outside the institute and regaled the president with nationalist anthems. The singers drowned out protesters who had gathered across the street, including one in a Russian scarf, accusing the Ukrainian president of ignoring atrocities against civilians in rebel-held cities.